I've decided you've had things a little too easy of late when it comes to getting your fix of The Worcester Park Blog. 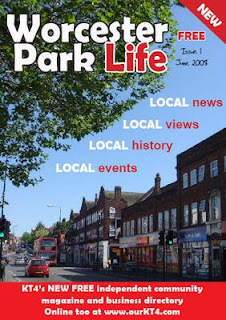 So I'm not putting my latest article online for your enjoyment - instead you will have to venture into Worcester Park and grab your free copy of 'Worcester Park Life' - the brand new magazine dedicated to all things KT4. Oh, and there's money-off vouchers for Worcester Park shops in there as well, which can't be bad.